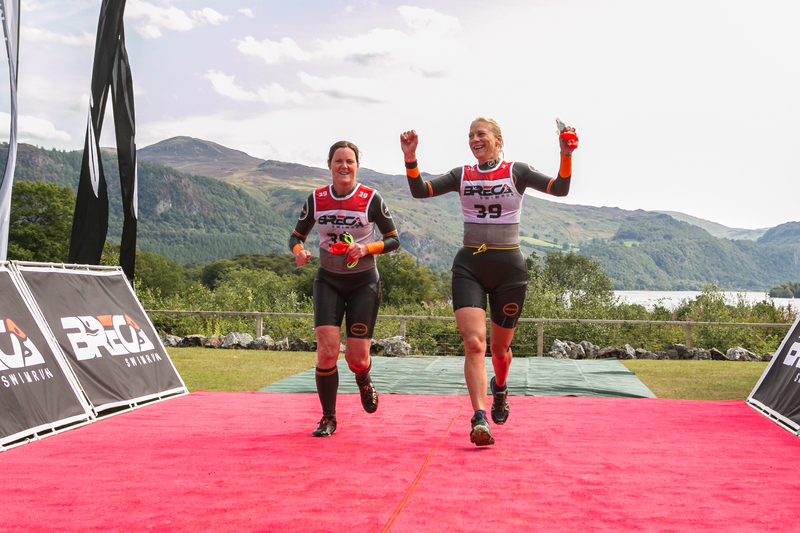 Neither of us had done a Swim Run before but were up for having a go; we realised that there were some decisions to make before we turned up on race day such as: What kit did we need? How would we race as a team? We had no time to train together or try out our kit so we decided to have a relaxed approach and enjoy the day out. As preparation we watched YouTube clips and had several helpful conversations with people who had experience of Swim Runs; then via email and text Sheona and I agreed our approach to the day. 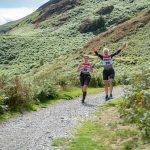 We decided to use some old fell running trainers and invest in a Swim Run wetsuit (a new wet suit is not necessary as there are other more cost-effective options). Also, there are optional kit items, e.g. pull buoys, paddles, tethers and neoprene calf guards. We decided not to use paddles as we have not trained with them (they can cause shoulder injuries if your muscles are not used to swimming with them). 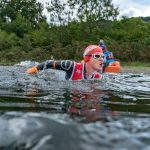 We did not to use tethers, they can be useful on swims and runs; I had used them on previous adventure races but not swimming and there is a knack to using them effectively (attaching and removing them or getting them tangled and knotted up can take longer than any time advantage gained using them). Finally, whilst we had both made adaptations to our pull buoys to use on the day Sheona decided to go with the calf guards. The event start was at Derwent Hill Outdoor Centre and we had booked overnight accommodation, so with an 8am breakfast, 9am briefing and 11am start we were excited about the morning lie in! We arrived at 8pm Friday evening, dumped our bags and headed off to the pub (only 10 mins walk – result! ); after all we had agreed a relaxed approach to the event, which meant lots of chat and a couple of glasses of wine. We bumped into another newbie team at the bar that had a similar approach to us and swapped stories with them for a while. After a comfortable night’s rest and a hearty breakfast, we registered, listened to the briefing which was relaxed and friendly; in fact over half of the teams were doing their first Swim Run event so we were not alone. 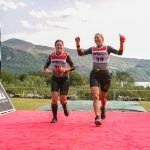 We then headed back to our rooms and embarked on our one and only team training session; how to take our wetsuit tops off and put them back on whilst running and wearing the race vest. After a bit of giggling and messing about we came up with a system that we hoped would work. We then wrote the distance of each section on the back of our hands with a permanent pen (I wrote the swim legs and Sheona the run legs) and headed down to the start. We began to feel nervous as we waited at the start and so headed off for a short warm up and tried to relax. Soon the start hooter sounded and we were off down the field for 500m and into the lake for the first 400m swim or so we thought! We were able to run through the water for the first 200m and then it was deep enough to swim side by side and breathing together so we could keep an eye of each other. This seemed to work well and over the event as swimmers on each leg thinned out spotting each other became easier. Due to our different swim speeds drafting didn’t work so well (although on reflection practicing using a tether would help this). Then we were out of the water and onto the short run before soon being back in the lake for the next leg. 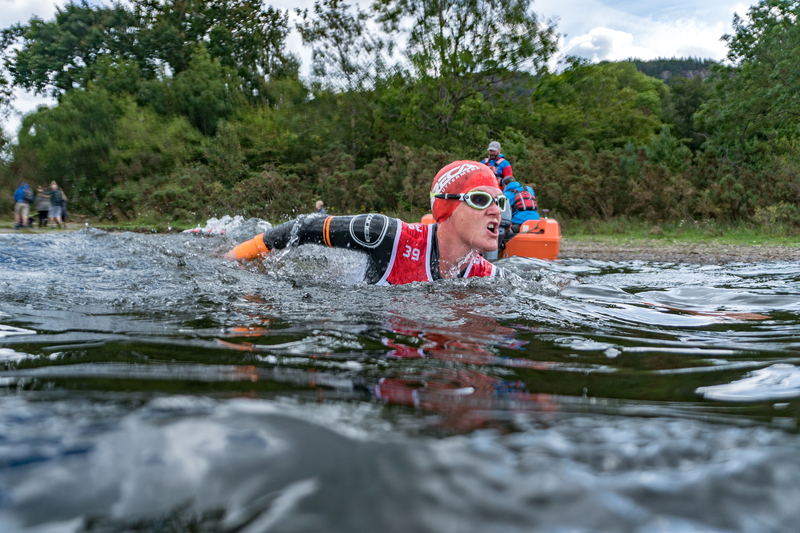 We had decided to only take our swim hats and goggles off if it was a longer run or if we were getting too hot; this meant we could keep moving quicker through the transitions. Sheona had not had chance to do any swim training and it was two years since she swam regularly (she had been training for a 200 mile bike charity bike ride), and she found she got dizzy switching from swim to run and visa versa; so, as we approached the second swim section she tripped and fell landing heavily on her shoulder but seemed ok to keep going. 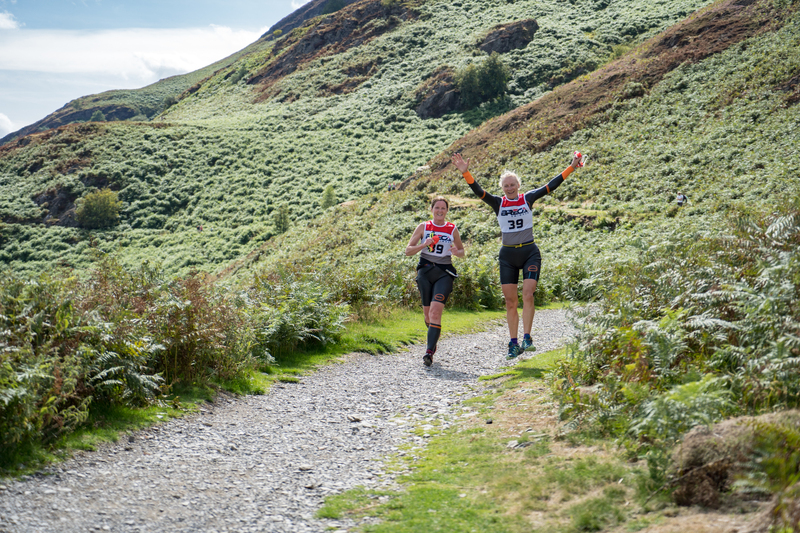 Before we started the event, I thought that I might get frustrated with the short legs and constantly changing from swim to run, however this was not the case as time passed really quickly and we were soon onto one of the two long run sections. We were not feeling hot so decided to keep our wetsuit tops on as we expected the run to take us no more than 35mins. Towards the end of this section was a feed station so we took water with our new reusable cups (a mandatory kit item), grabbed a couple of jelly babies and headed off towards the next swim section. We were also quite excited about the next feed station which was going to have cold potatoes and salt… still we would have to wait for that treat! There is not much more to say about the event itself other than we swam and ran though amazing scenery; the water was a bit choppy and we enjoyed it. Suddenly we were onto the penultimate run leg which was 7.6k with some ascent. The final feed station did not disappoint, the cold potatoes were ace! By now the day was hot and sunny so Sheona decided to run with her wetsuit top down, which was great as we were able to test out our system and it worked well. As we arrived for the final swim we were told that the entry was a bit muddy, which was an understatement; we found that the best way to travel across 250m of the final 300m swim was to lie on our fronts in the water and to pull ourselves along using the weed and mud below as it was too shallow to swim and too muddy to run. 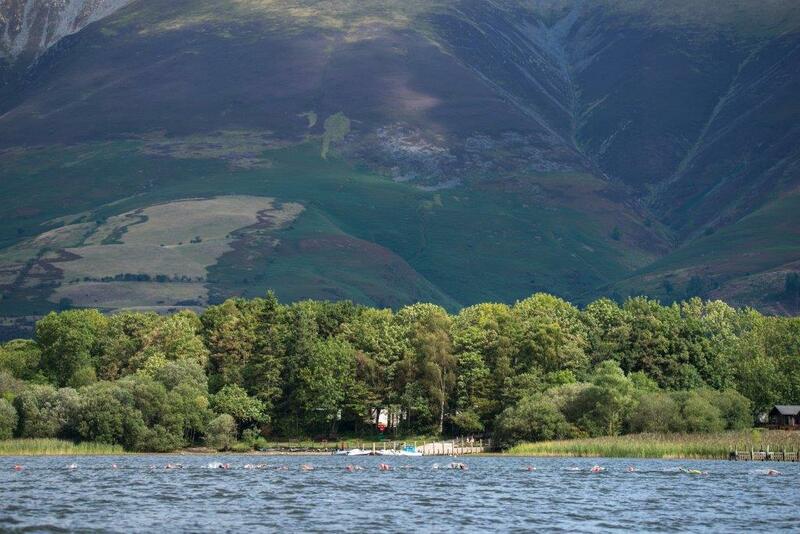 A final 50m swim brought us out just below Derwent Hill Centre and the finish line. We set off running and took look a quick look behind us to make sure that we were not going to be overtaken by any other teams, then we slowed down and tried to get the mud out of our hair and smarten ourselves up for the finish; we didn’t want to look too muddy for our finish line shots…and then we were being cheered over the line, we had finished and were not too wrecked! We were still laughing and after a drink and food from the BBQ we were feeling good and happy with our day out. We have learnt lots and hopefully I can persuade Sheona to do another one next year. 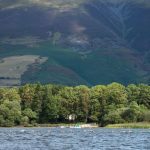 We have learnt loads and know we could improve on our times and still have fun; I am sure that I will do more Swim Runs and would like to go for one of the longer events next year.